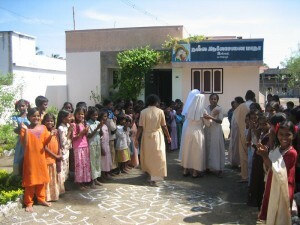 The mission in India, set up in the early 1990s, is one of the largest for the Sisters of Charity of Saint Mary. The country boasts many impressive sights, and the splendour of its monuments and temples enriches its history. Unfortunately, half of the population is still illiterate and more than a quarter live under the poverty threshold. This is the reality that the Sisters of Charity have had to cope with as they struggle to reduce poverty among families in certain areas. The orphanage they run cares for a large number of children and serves meals Monday through Friday. 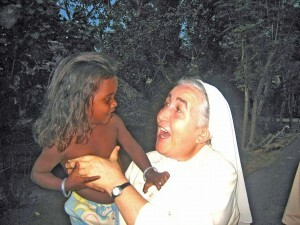 The sisters touch the lives of some one hundred children every day. They are helped by several of their local members of the Congregation. They also regularly visit a leprosy treatment centre and operate a child care centre for the victims of this disfiguring disease. 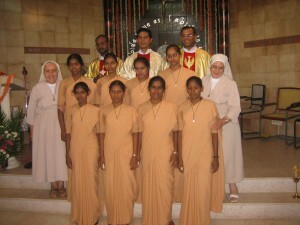 The religious habit worn by the sisters in India is a beige sari.